Hows it going everyone? So I am buying a Barrel from Lothar Walther and they are requiring that I fill out for BIS-711. 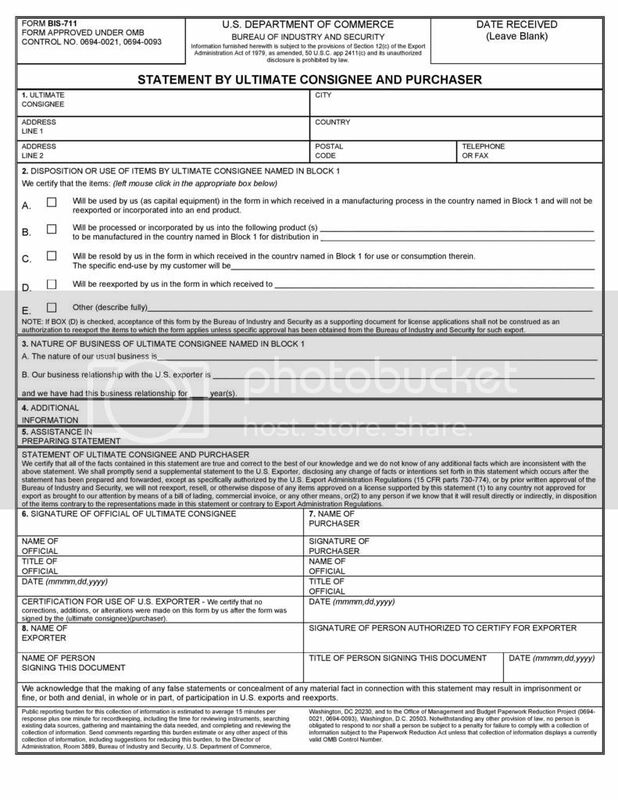 Has anyone filled this form out and what exactly do I put and where. I hate the wording of things as it makes no sense to me. What do I fill out and what do I not fill out? Any help would be greatly appreciated as I want to get this dropped in the mail tomorrow for them. ?? Never see that. Are you in the US ?? I sure am. The great state of Oregon. Woody said the DHS just started requiring this form to be filled out. My only thought is because the barrels are imported into the US they want to make sure there is a paper trail of barrels and if they are going to be exported again and resold or staying here. I hate the wording on the forms for sure. I just wish I was easy. There aren't any examples of it filled out that I have found. I am wondering if it's just for barrels being imported from overseas originally and the DHS just wanting to make sure they stay here. Seems like an awful lot of work for a barrel. Try a reseller here (if any). What is this crap? To purchase a barrel? Never heard of it and seems ridiculous. Many companies offer Lothar Walther barrels, like Spike's Tactical, etc. Buy from one of them and avoid this crap, IMO. Buy one from a retailer, or buy a different barrel. Is it because Lothar Walther is not in US? You can buy LW barrels from several retailer and avoid this. I've never seen or heard of that, nor would I do it. There are too many quality barrel manufacturers to put up with that BS. Follow us on Instagram at tier1_douchebags! That looks like it's for a business, not an individual. Why would you want a non American barrel on an AR15? The AR15 is OUR rifle! Keep it American! Upgrade now to Human 2.0! Because LW makes phenomenal barrels. "The main thing is to make sure your name and address is on it. Folllowed by what your use is for. It will not be perfect so just fill it out best as possible." Apparently it's so new that they don't even know exactly how it should be filled out. As a president of the company you'd think they should know exactly. If it wasn't for a great price on a great barrel I would be going somewhere else. If I could find that same barrel for the same price elsewhere I'd do that instead for sure. I haven't sent the check yet so if someone can point me to a place that has that exact deal I am all for it. I imagine the form is needed by all people / resellers when buying directly from the manufacturers.... especially a foreign manufacturer. It really isn't a big deal, it is more of a " I will not resell this product outside of the USA." Quite honestly .... I would phone them again and double check. I really think it is more of a "Cover my keister" thing for them. Who Will be Required to Complete a BIS711 Form? All Customers with Foreign “Ship-To” addresses. Those Domestic customers we know or believe will export our product. If there are questions related to information contained on the BIS711 we will be consulted for feedback. Final Customer (End User/Ultimate Consignee) must complete Sections 1 through 6. All sections should be either typed or printed legibly in English. Complete shipping/mailing address must be provided in Section 1. Proposed End Use of product must be indicated clearly in Section 2. Both A and B in Section 3 must be completed by the Final Customer. Section 4 – Additional information is optional. Section 5 – Complete only if Final Customer is assisted in completion of the form. Section 6 – Must be completed the Final Customer and must be signed. Section 7 – as indicated above need only be completed if Purchaser is different than Final Customer. Who's Woody and who exactly are you buying it from? Probably has to do with ITAR. I remember Woody mentioning ITAR during one of our conversations a couple years back. However, being this is not an export, I'm not sure why they need it. All that said, I'd fill one out if asked to buy another Lothar Walther barrel with a matched bolt. Sure, it's a "hassle" compared to the majority of barrel purchases, but IMHO the barrel is worth the added hassle. If you don't want to deal with it, get a Krieger. Woody Woodall, CEO of Lothar Walther Precision Tools, Inc. here in the USA. This item or items are subject to restrictions pursuant to the Arms Export Control Act (Title 22, U.S.C., Sec. 2751 et seq. ), Executive Order 12470, federal regulations, including, but not limited to, the International Traffic in Arms Regulations (22 C.F.R. § 120, et seq. ), and/or other federal laws and regulations. The export or other transfer of this item or items outside of the United States, whether in original form, altered form, as a constituent part, or otherwise, is prohibited without proper, prior authorization from the United States State Department and/or other departments and agencies of the United States. This data may not be resold, diverted, transferred, transshipped, made available to a foreign national within the United States, or otherwise disposed of in any other country outside of its intended destination, either in original form or after being incorporated through an intermediate process into other data without the prior written approval of the U.S. Department of State. Violations may be punished by severe criminal and/or civil penalties. The item or items may be subject to other restrictions. Lothar Walther Precision Tool, Inc. does not provide legal advice; you should consult your own legal counsel regarding these issues.